The feature event of the Rosehill Guineas Day – the Rosehill Guineas – will be the second to last race on the day, but will hog much of the attention as the 16 horses that have been presented for the race battle it out to claim the $500,000 purse in Sydney on Saturday afternoon. Peter McKay’s Puccini will be the favourite going into the race, with jockey Michael Walker looking to put up another win. Puccini will by no means have it all his own way on Saturday afternoon, however, with Dissident, Shamus Award and Teronado tipped to put up a strong challenge. The best place to have a bet on the 2014 Rosehill Guineas is with Bet365.com. The odds below were taken from the site, and you will be able to find the latest race odds there as well. Bet365.com is also offering each-way betting on the race, with which you will receive 1/4 if should your selection place in positions one to three. The Peter Moody-trained Dissident is a winner in his last two starts, with a win on a slow track at Rosehill over 1400 metres in a Group 2 race followed up with victory in the Group 1 1600-metre Randwick Guineas. Joining Puccini and Dissident as one of the top three most likely favourites for the race is Danny O’Brien’s Shamus Award, who comes into the race with some solid form, having taken the spoils in the Group 1 Australian Guineas over 1600 metres before finishing sixth in the Group 1 Australia Cup at Flemington over 2000 metres, the same distance as the Rosehill on Saturday. These two horses will have to come against the Puccini, however, who will be racing for the first time in Australia. 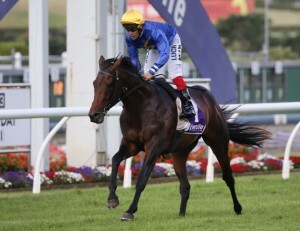 The New Zealand-bred McKay horse has tasted victory in his last three races, most recently the Group 1 New Zealand Derby at Ellerslie over 2400 metres. He will be dropping down in distance for the race this Saturday, though McKay does not expect this to be a problem. For the rest of the pack, look out for Atlante, who will be wearing blinkers after finishing sixth at the Randwick Guineas, is also a Group 1 winner in New Zealand. Teronado has also won in the wet before. As mentioned above, the best racebook to place a bet on the 2014 Rosehill Guineas is Bet365.com, who will offer the best odds on the race. When visiting Bet365.com, click on ‘Horse Racing’ in the left sidebar and scroll down to the Antepost section of the page, where you will find the markets for this race and many more. The Rosehill Guineas is a Group 1 race for three year olds, and is run over a distance of 2000 metres at Rosehill Racecourse. The race has a purse of $500,000. Check out the official Rosehill website to keep up with the latest news coming from the event.